Here I am again, writing with excitement about new oral health products! Quantum Health sent me some of their new, natural, oral health products to try out. 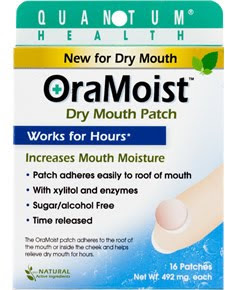 OraMoist is a time-released disc that adheres to the roof of your mouth or the inside of your cheek. It slowly dissolves and has increases saliva production and relieve dry mouth. My mouth has been so dry this winter, despite drinking lots of water, that it has been keeping me up at night. I tried humidifiers and hydrating until I can’t stand it, but nothing was working. OraMoist was surprisingly comfortable to use. Once I stuck it to the roof of my mouth, I barely noticed it was there. I fell asleep, and stayed asleep, because it worked well.. It had a light, slightly sweet lemon flavor. The packaging says it lasts from 2-4 hours, but I noticed improvement even after the tablet had dissolved. This was easy to use, and quite a relief. I shared the second product, Canker Cover, with my little brother. He gets canker sores a lot, and never found anything that helped to his satisfaction. The Canker Covers work similarly to the OraMoist tablets. Hold the small tablet to the canker sore for about 20 seconds. It becomes a clear gel that lasts 8-12 hours. It protects the area and allows canker sore sufferers to eat, speak, and drink normally without pain or discomfort and speeds the healing process. My brother said it was comfortable, easy to use, and “really works!” He is a man of few words, but he said he got a lot of relief from Canker Cover. 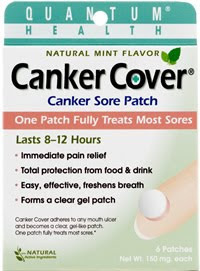 If you’re interested in trying these products, check out the websites www.cankercover.com and www.oramoist.com. The company also offers a clear cold sore healing lip balm at www.lipclear.com.